An Airport Master Plan is a long-range planning document that serves several important purposes for Chicago Executive Airport, airport users, and the local communities. The Master Plan Update’s purpose is to evaluate current and projected aviation demand and identify what airport improvements would be needed to satisfy the demand over a 20-year planning horizon. An Airport Master Plan Update provides a strategic vision and development plan and recommendations for Short-Term, Intermediate, and Long-Term capital improvement projects. Because the aviation industry is ever changing, a strategic Airport Master Plan Update should be flexible and updated regularly to ensure this community asset is properly managed and remains financially viable in the future. What are the components of an Airport Master Plan Update? The Airport Master Plan Update process is guided by the FAA and ultimately results in projections of future aviation activity growth and preparation of an Airport Layout Plan (ALP). What is an Airport Layout Plan? An Airport Layout Plan (ALP) is a set of drawings that graphically depict existing facilities, the development projects identified in the Airport Master Plan Update, and how the facilities meet applicable airport design standards. Who is preparing the Master Plan Update? For the Airport Master Plan Update, the project team will balance all the essential federal and state regulations, the needs of the surrounding community and the future needs of the airport while engaging stakeholders and seeking input throughout the process. No municipal funds are being expended on the Master Plan Update. The Master Plan is eligible for Federal and State Reimbursement at 95% and NO property tax increases will result from the Master Plan Update. The Board of Directors of CEA have chosen to accomplish the planning effort in phases. The level of detail and complexity within the planning effort will increase as the process plays out. Proceeding deliberately will ensure the transparency and community involvement. Phase I planning was initiated in the Summer of 2014 and completed in Summer 2015. Click here to view the Phase I Visioning Report. Phase II of the Master Plan Update was conducted in two parts due to budget constraints. Part Two – Facility Requirements requires FAA acceptance and the FAA review is currently on-going. Click here to view the Phase II Aviation Forecast and Facility Requirement Reports. We are currently entering Phase III of the Master Plan update with includes Alternatives Development, evaluation and screening and ultimately Preferred Alternatives will be identified with a Preferred Concept Development Report completed by the Fall of 2019. 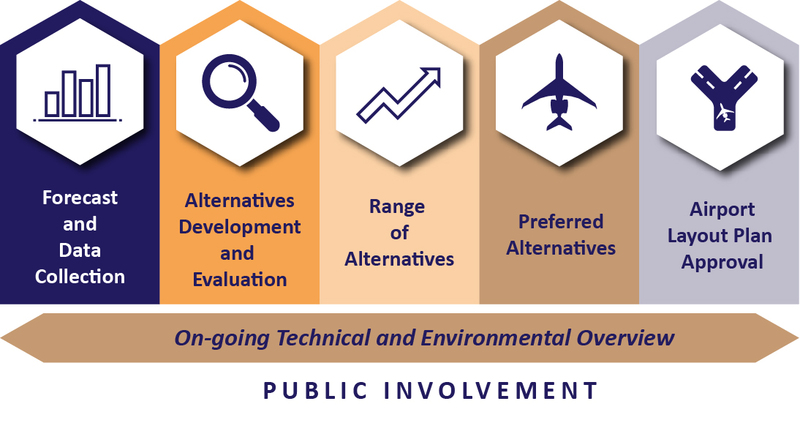 The Alternatives Development and Evaluation process is FAA-mandated. One key element of the process is including the No Action or Do Nothing” alternative in the evaluation. The no-action or no-build scenario will be evaluated with each preferred alternative. This alternative will be included in each set of alternatives developed and analyzed. It is anticipated that Phase III work will begin in the Fall of 2018 with a Preferred Development Concept Report in the Fall of 2019. The next step in the Master Plan Update process would be the Airport Layout Plan (ALP) which is a scaled drawing depicting existing and proposed future facilities and property necessary to the operation and development of the airport. An ALP is a requirement of the FAA, and the ALP must be approved before development can begin. Much like a community comprehensive plan, this is done to ensure that CEA can coordinate project approvals, design, financing, and construction to avoid facing unfavorable effects due to insufficient facilities.